Shivanasamudra is an island town where the Cauvery river splits itself in to two parts and drops over a cliff and joins again. 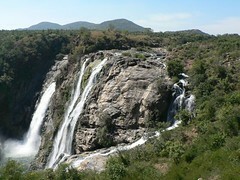 The two falls are known by the names Gaganachukki and Barachukki. The remains of some ancient temples can be found in this island town. To see the waterfall in full flow one has to arrive during the post-monsoon season typically from August to December. There are many shops selling snacks and cool drinks near the falls. Often people take packed food and have it at the falls ( Please make it a point not to litter this place ). Shivanasamudra is 120km from Bangalore. Route 1: Bangalore - Kanakapura - Malavalli - Shivanasamudra. From KR Market there are KSRTC and private buses runnig till Malavalli. From Malavalli there are only few buses available to the falls.